check later this week. Have a good evening. While eating something-on-a-stick at the Thursday Street Market, I ran into Angelo Villagomez. As we sat and discussed how to save the world, the conversation came around to oldtown Garapan revitalization. Angelo espoused a couple of ideas that made a lot of sense to me and I will pass them on to you for your edification. (Notice how I deftly laid it off on Angelo in case you think the idea is wacky). He believes that to make the place better, jobs, like government agencies, and other office type private job generating businesses need to move into the Garapan downtown area. Tourists would like to participate in a “real” local experience, not just a tourist sham experience put up for their benefit. Tourists want to meld into an already existing unique cultural enclave a la San Francisco.cable cars, rice-a-roni, wharf, Nob Hill, China Town etc. Tourists come to see the local ambiance in a location, not to create it. Also needed are people to move their residences into this area, real working folks, living there full time. 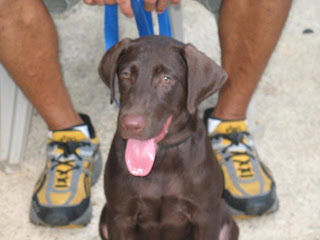 Angelo has already moved in there for whatever nefarious reasons (kidding) and would like to see others do the same. Real residents walking the streets (no, not street walkers), using the business facilities and adding foot traffic to a sometimes barren area will make it a pleasant and comfortable feeling place to go. He has a good point on both counts, if you ask me. So MVA, find yourselves a new or now empty building somewhere in Garapan and move on in. 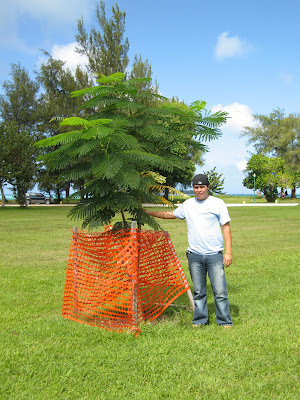 In 2007 Beautify CNMI planted about 200 Flame Trees (I think) as part of our Adopt-a-Flame Tree Program. 6 of those trees were planted in American Memorial Park last June during our Micronesia Challenge Summer Camp and they were adopted by Barney Ono, a Japanese citizen living in Japan who has kept track of Beautify CNMI via the Internet. I had the chance to visit those six Flame Trees earlier this morning and I am happy to report that they are all doing very well. This picture was taken next to the largest of the six. Barney, the next time you visit Saipan, make sure you look for your six healthy Flame Trees growing in our local National Park. We were scheduled to have a session last Friday, so I couldn't join the Beautify CNMI event that the Saipan Chamber of Commerce and Angelo Villagomez set up. They managed to pair 100 visiting marines with students from Garapan Elementary School. Thanks to Principal Boni Gomez for her usual 100% support of Beautify CNMI events! I checked in on the crew on my way up to the Hill and arrived just in time to see Principal Boni lead her charge to the American Memorial Park parking lot. Here we are prepping the kids before the marines arrived. She said a few words... . . .and then I said a few words... ...and then I thanked them and wished them a great day and went on to the session. Again, thanks to the Marines, Principal Gomez and the students and faculty of GES who participated in the cleanup, and all the participants for the awesome job they did cleaning up the Garapan Tourist District. Thanks, Angelo, for anchoring the event!